The land between my house and the road supports about a dozen trees and years of carefully nurtured native Texas grasses and wild flowers. When the wild flowers have all gone to seed I get out in the early morning to mow. I use a scythe for mowing. A scythe? You know that long, nasty looking thing that death carries around; that’s a scythe. It’s an old, old tool that when sharpened to a razor’s edge and swung by skilled hands cuts plants as smooth as butter and as easy as pie. A scythe is an uncommon tool. It has almost been universally supplanted by gasoline-motor driven lawn mowers, weed-whackers, and leaf blowers. But as a human-powered, highly efficient and non-polluting tool, a scythe cannot be beat. See http://www.scythesupply.com for all things scythe. There is a contrast between the hard, fast-pace of city life and the measured bucolic acceptance of life in the country. So much of modern life seems to be built around stress, unhealthy foods, minimal exercise, and making the world fit into preconceived notions. For me old hand tools symbolize old wisdom and ways of living that flow with the grain of life. Old tools evoke old traditions and the keepers of everything old are the elders in any community. This is true in many cultures except perhaps in the US where we seem to shun traditions and savor the new. Thus, I find it interesting that a modern man can use an old tool and by applying a contemporary viewpoint (e.g., seeking a meditative state while doing manual labor) accomplish a task and improve his health. The lesson is that the old tools, old ways and old people have much to teach us about wellbeing and life. Merton, T. The Way of Chuang Tzu. New Directions Publishing Corporation, NY, 1965. Vido, P. The Scythe Must Dance. In D. Tresemer. 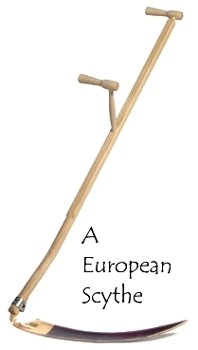 The Scythe Book, Second Ed. Alan C. Hood & Company, Chambersburg, PA., 2001.